The Meadow Jumping Mouse has coarse yellowish-brown upperparts, a broad dark dorsal stripe, a white venter, and yellowish-brown sides paler than the back. The young have softer, paler pelage. The tail is longer than the head and body, is round, sparsely haired, and bicolored (dark above, light below); the hind legs are much longer than the forelegs. The preorbital foramen of the skull is large and oval, and the nasals extend noticeably beyond the incisors. There are 18 teeth in the skull (dental formula: I 1/1, C 0/0, P 1/0, M 3/3). The upper incisors are grooved on the anterior surface, and the single upper premolar is quite small. Body measurements are: total length 187 to 255 millimeters, tail 108 to 155 millimeters, hind foot 28 to 35 millimeters, ear 11 to 16 millimeters and mass 12 to 22 grams (Whitaker 1972). The only species with which the Meadow Jumping Mouse might be confused is the Western Jumping Mouse (Zapus princips) where their ranges overlap. The Meadow Jumping Mouse is smaller and darker in color, with more yellowish-brown on the sides. The tail is sharply bicolored, unlike the bicolored tail of the Western Jumping Mouse. The premolar is small, and the maxillary tooth row is less than 3.7 millimeters in length (Clark and Stromberg 1987, Foresman 2012a, 2001b). Jumping mice lack the external fur-lined cheek pouches present in pocket mice. This species is non-migratory. No information is available specific to Montana. Elsewhere, home ranges were determined to vary from 0.14 to more than 4.0 acres (Jones et al. 1983), and location shifts of up to 0.8 kilometer were observed (Whitaker 1972). In Montana, Meadow Jumping Mice have been found in dense, tall and lush grass and forbs in marshy areas (sometimes with standing water), riparian areas, woody draws, and grassy upland slopes, sometimes within or near forested sites of ponderosa pine (Lampe et al. 1974, Matthews 1980, Matthews and Swenson 1982). The Meadow Jumping Mouse is generally described as a species which occupies moist lowland habitats rather than drier uplands, preferring relatively dense vegetation in open grassy and brushy areas of marshes, meadows, swamps, open conifer forest, and often favor sites bordered by small streams. On the Northern Great Plains this usually results in its restriction primarily to riparian habitats. When inactive, they occupy underground burrows, usually in banks or hills (winter), or under logs or grass clumps. Young are born in an underground nest or under other cover (Krutzsch 1954, Whitaker 1972, Jones et al. 1983). The diet of the Meadow Jumping Mouse includes a wide variety of invertebrates (especially insects), seeds, leaves, buds, fruits, and subterranean fungi (Krutzsch 1954). They forage mostly on the surface, but sometimes dig. In one New York study, animal matter composed close to half the diet in spring, and seeds about 20%. As the season progressed more seeds and less animal matter were consumed, and fungi (Endogone) became more important. Seeds, particularly grass seeds, were the basic food in general, used in sequence as they appeared in the field. The most important animal foods were lepidopteran larvae, and beetles in the ground beetle and weevil families. Available evidence indicates the Meadow Jumping Mouse does not store food (Whitaker 1972). 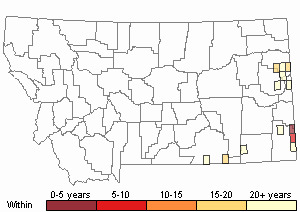 The diet in Montana has not been studied or reported. Meadow Jumping Mice are basically solitary and docile, and usually nocturnal. They hibernate in winter, beginning in late September in the east, but more often in October, and emerge in late April and early May (Krutzsch 1954, Whitaker 1972). The inactive period in Montana may be longer; all individuals have been captured during June to August (June 2 to August 29), and none have been taken in the same areas during spring trapping sessions (Lampe et al. 1974, Matthews 1980). They may shift their activity area in response to seasonal drying of habitat. Neither runways nor burrows are used extensively during the active period, other than the burrow leading directly to nests or hibernacula. Summer nests are usually on the surface of the ground in globular balls of grass. Winter burrows are placed underground or under logs and lined with leaves or grass, and placed approximately 0.3 to 0.5 meter below the ground surface, using moist locations (Krutzsch 1954, Whitaker 1972). Predators include Barn and Long-eared Owls, Red-tailed Hawk, weasels, American Mink, skunks, foxes, Coyotes, frogs and rattlesnakes (Krutzsch 1954, Whitaker 1972, Jones et al. 1983). 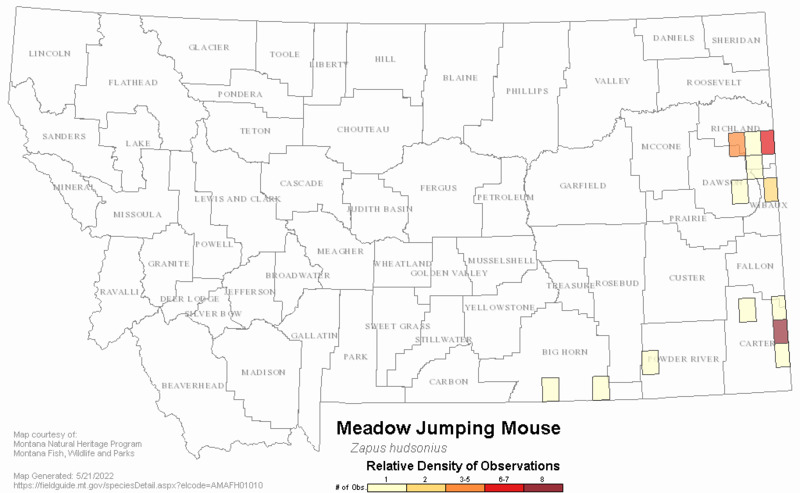 Predators of Meadow Jumping Mice in Montana have not been reported. Winter mortality is probably the most important cause of death in Meadow Jumping Mice less than one year old, and possibly adults as well (Jones et al. 1983). Population density varies considerably from year to year and with site quality. Estimates in Minnesota ranged from 48.3 per hectare at one site to monthly estimates of 7.4 to 14.4 per hectare at a second site (Whitaker 1972). 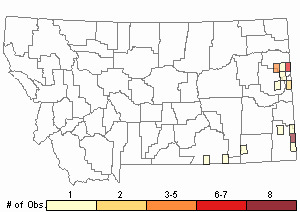 There is no information on population density or trends in Montana. Little information is available on reproduction in Montana. Six of 14 females captured in July in Carter County were carrying embryos; mean number of embryos was 6.0. Three adult and five juvenile females were neither pregnant nor lactating (Lampe et al. 1974). In general, the Meadow Jumping Mouse is known to breed from late April to early September. Gestation lasts 17 to 21 days. Litters were born in every 10-day period in New York from May 11 to September 20; most litters in Minnesota were born between mid-June and the end of August. Litter size is 2 to 9 (averages from different studies ranged from 4.5 to 5.7); individual females may produce up to 2 or 3 litters per year (Whitaker 1972). Young are weaned and independent in about 4 weeks. Most first breed in the summer following their birth. Maximum longevity is 2 to 3 years. No special management activities have been developed or implemented for this species in Montana. Alteration of natural surface water sources for livestock, especially free-flowing springs and seeps, could have negative impacts on populations, given the preference of Meadow Jumping Mice for grassland sites whose structure is influenced by the nearby presence of water (Lampe et al. 1974, Matthews 1980, Matthews and Swenson 1982). A thorough small mammal survey of appropriate mesic grassland, shrub-grassland, and meadow habitats in eastern and southeastern Montana is desirable to define the distribution and relative abundance of this species in the state. Clark, S.G. and M.R. Stromberg. 1987. Mammals in Wyoming. University of Kansas Museum of Natural History, Public Education Series Number 10. xii + 314 pp. Krutzsch, P.H. 1954. North American jumping mice (Zapus hudsonius). University of Kansas Publications, Museum of Natural History 7:349-472. Matthews, W.L. 1980. Note: the meadow jumping mouse in southeastern Montana. Prairie Nat. 12(2):63-64. Matthews, W.L. and J.E. Swenson. 1982. The mammals of east-central Montana. Proc. Mont. Acad. Sci. 39: 1-13. Whitaker, J.O., and R.E. Wrigley. 1972. (Zapus hudsonius). Mammalian Species No. 11 7 pp. Douglass, R.J., and McNaughton, A.E.L. 1977. 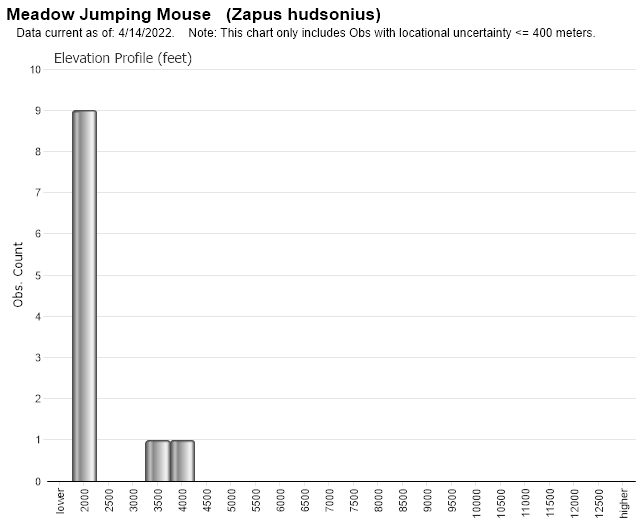 A recent record of the meadow jumping mouse, Zapus hudsonius, in the Northwest Territories. Can. Field Nat. 91: 96-97. Federal Register 63: 1998. Endangered and Threatened Wildlife and Plants; Final Rule to List the Preble's Meadow Jumping Mouse as a Threatened Species. May 13, 1998. 50 CFR Part 17 RIN 1018-AE06. pp. 26517-26530. Flath, D. L. 1984. Vertebrate species of special interest or concern. Mammals, birds, reptiles, amphibians, fishes. Spec. Publ. Montana Department of Fish, Wildlife, and Parks, Helena. 76 pp. Frey, J. K. 1992. Response of a mammalian faunal element to climatic changes. J. Mamm. 73:43-50. Hafner, D.J., K.E. Petersen, and T.L. Yates. 1981. Evolutionary relationships of jumping mice (genus Zapus) of the southwestern United States. Journal of Mammalogy. 62:501-512. Hoyle, J.A. and R. Boonstra. 1986. Life history traits of the meadow jumping mouse, Zapus hudsonius, in southern Ontario. Canadian Field-Naturalist. 100:537-544. LaVelle, Darlene. 1988. 1988 Nongame surveys in Region 5 and Region 7.' MTFWP. 40pp. Pefaur, J.E. and R.S. Hoffmann. 1971. Merriam's shrew and hispid pocket mouse in Montana. American Midland Naturalist 86(1):247-248. Quimby, D.C. 1951. Life history and ecology of the jumping mouse, Zapus hudsonicus. Ecol. Monogr. 21(1):61-95. Web Search Engines for Articles on "Meadow Jumping Mouse"